MLS designated the final round of matches in the 2015 regular season as Decision Day. Some playoff spots were still up for grabs and Sunday’s results finally resolved postseason matchups. For the New York Red Bulls, Decision Day was a two-pronged battle: they would face the Chicago Fire on the field, and they were vying for the Supporters Shield with Western Conference leaders FC Dallas. 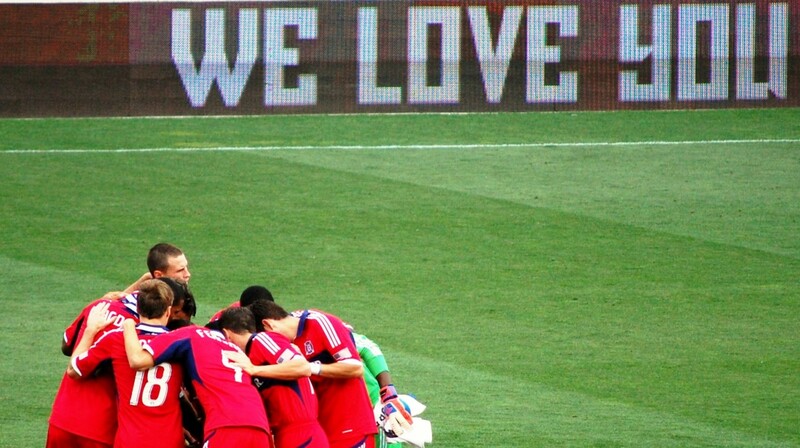 The Fire, already locked in as the very bottom team in MLS, could only spoil the party for the Red Bulls. Examination of coach Brian Bliss’ starting lineup, however, indicated that the Fire might be intending to spoil the party for FC Dallas instead. He inserted four players into his 11 who have played very little this season and called into question whether this was the most competitive team the Fire could have produced for a match that had meaning. The back of the team comprised goalkeeper Alec Kann, who was seeing his first action this season, along with Matt Polster, Chris Ritter, Jeff Larentowicz and Patrick Doody. Utilizing Polster at fullback left an opening at holding midfielder and Bliss inexplicably chose the pedestrian Matt Watson to pair with Razvan Cocis, when the industrious Michael Stephens would have been a better choice. Joevin Jones got pushed forward from fullback to wing, while Patrick Nyarko started on the other side. Harry Shipp started in the central midfield, just behind striker Gilberto. Bliss stated afterwards that he used the match to give these little-used players an opportunity to play. This begs the question of why Homegrown Player Collin Fernandez was not given a chance. It’s pretty clear what players like Watson and Ritter can contribute. They won’t be around if the Fire ever become competitive again. The 18-year-old Fernandez might well be part of a Fire midfield in the future. Selecting him for the roster on Sunday, but having him rooted to the bench is a head-scratcher. The Red Bulls looked like they had something to play for from the outset, pressing their forwards high up the field when the Fire tried to work the ball out of the back. The Fire looked jittery and the eager New Yorkers sought to strike quickly. It took them just eight minutes to find the back of the net and the Fire’s ineptitude when defending a set piece was once again embarrassingly juvenile. As Sacha Kljestan was setting up for a corner kick, the Fire were finding their marks inside the penalty area. Glaringly, Red Bulls striker Bradley Wright-Phillips was camped out in Kann’s six-yard box, unmarked. The closest Fire player was Doody, who was standing in that same six-yard box, with his back to Wright-Phillips, seemingly oblivious to the fundamental responsibility of finding someone to defend on a corner kick. Whether Kann could have done better to organize his teammates is unclear, but he was certainly not emphatic about getting someone to cover an open player on the doorstep of his goal. The corner was converted in ridiculously easy fashion. Kljestan crossed the ball in towards the near post, where Sal Zizzo headed it along to Wright-Phillips, who did not waste the gift opportunity. The disjointed Fire managed one decent chance in the first half, when Gilberto collected a lofted pass with his chest, turned a fired at goal. Luis Robles read the play well and easily dove to his right to make the grab. The Red Bulls’ pressure put them in control of the tempo and they added to their lead ten minutes before halftime. Mike Grella initiated a give-and-go with Wright-Phillips on the left side. Grella sprinted past Nyarko, who had been a step behind Grella during this entire sequence. Grella received the return pass, but his path to goal was cut off by the trailing Nyarko. As Grella approached the byline, Nyarko foolishly bumped him from behind, prompting referee Ricardo Salazar to award the visitors a penalty kick. Nyarko, despite trying to catch up to Grella, had no reason to even make contact with him. Grella had no angle for a shot and did not have a great angle to even get in a cross. Nyarko should have simply shepherded him towards the goal line and would have conceded a corner, at worst. Kljestan sent Kann the wrong way on the penalty and the Fire were all-too-generous hosts en route to a 2:0 halftime deficit. This scenario would have been a great opportunity for Bliss to make changes during the break. His options became limited thanks to Ritter’s injury in the first half, forcing a switch to Daneil Cyrus at centerback. David Accam eventually entered in the 58th minute and his energy provided the Fire attack with a spark. Combined with New York taking their foot off the gas, the Fire came back into the game. Shipp played reasonably well in the creator’s role, making himself available, spraying quick passes to teammates, and refreshingly, not hanging on to the ball too long. Jones made several telling runs into space on the left to stretch the New York defense. The Fire culminated a well-crafted build-up in the 73rd minute with a near-miss. Cocis found Accam in the middle, and he quickly swung a pass into the right-wing channel for the advancing Polster. He centered for Accam, now inside the box, and Accam’s volley pinged off of the goalpost. The Fire halved the deficit five minutes later. Shipp rewarded Doody’s supporting run on the left wing with a pass into space. With the Red Bulls retreating, Doody had time to send a booming cross to the left post, where Accam headed the ball back into the middle for Gilberto. The striker hit an off-balance half-volley past the diving Robles to give the big crowd something to cheer about. It’s fair to ask whether this level of composure and field vision might have surfaced at the start of the contest if Bliss had created a lineup that could deal with a hungry Red Bulls team, who aggressively sought early control in order to make their pursuit of the Supporters Shield a little easier. With this debacle of a season finally concluded, the only thing left is to see whether the vision that Nelson Rodriguez described in his opening press conference can be realized in a quick turnabout. Rodriguez claimed that high-profile coaches have already expressed an interest in the Fire head coaching position. Rodriguez and his new coach will have a big job ahead of them. The Fire’s Decision Days in this off-season must be on target with respect to which players stay and which players go. ← Who is the Next Chicago Fire Coach?